Participants at the consultation on "Current and Future Trends in Theological Education." 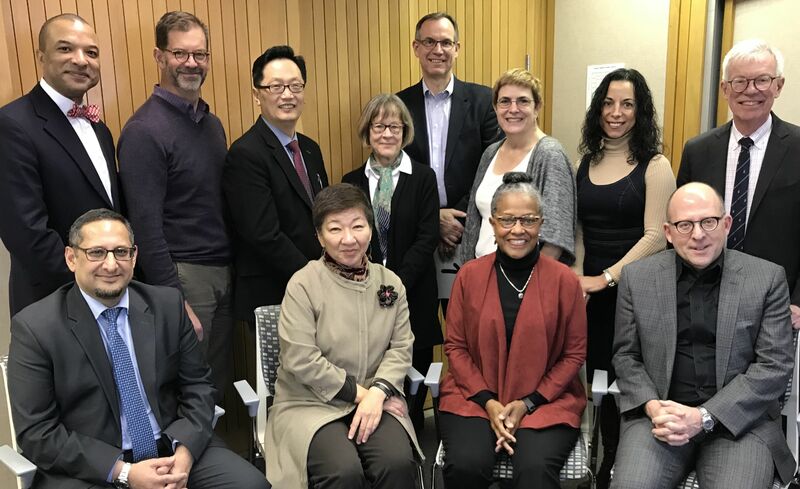 On January 14-16, 2019, the Graduate Theological Union was pleased to host a regional consultation on the theme of interreligious theological education as part of a three-year study of “Current and Future Directions in Theological Education.” The project, designed to cultivate sustained reflection and conversation on theological education at the field level, is funded by the Henry Luce Foundation, and overseen by Lancaster Theological Seminary. Rev. Dr. David Mellott, president of Lancaster Theological Seminary, and Dr. Deborah Flemister Mullin, emerita professor at Columbia Theological Seminary, served as cofacilitators for the consultation. Three GTU faculty members were among the presenters at a series of sessions focused on interreligious theological education. Dr. Judith Berling and Dr. Munir Jiwa presented as part of a conversation on the current state of interreligious education in theological schools, while Dr. Jiwa also spoke about the work of the GTU’s Center for Islamic Studies in a session on interreligious education and public engagement. GTU Dean Uriah Kim presented in the session on interreligious theological education and institutional change. After the conclusion of the working sessions on January 15, artist Salma Arastu led participants on a guided tour of “Seeking Oneness,” the current exhibition at the GTU Library, which features her work. Large photo above: Participants from the consultation on "Current and Future Directions in Theological Education," January 15, 2019. Front Row (l-r); Munir Jiwa, GTU; Boyung Lee, Illiff School of Theology (previously at PSR); Deborah Flemester Mullin, Columbia Theological Seminary; David Mellott, Lancaster Theological Seminary. Back Row (l-r); Ken Walden, Gammon Theological Seminary; Christian Scharen (GTU alum), Auburn Seminary; Uriah Kim, GTU; Heida Hadsell, Hartford Seminary; Stephen Graham, Association of Theological Schools; Rachel Mikva, Chicago Theological Seminary; Teresa Delgado, Iona College; Michael Gilligan, Henry Luce Foundation. Smaller Photo: Artist Salma Arastu speaks with participants at the consultation.